On a TARDIS and a wish, the Doctor returns and attempts to help Madge and her two children, Lily and Cyril, have the best Christmas they can. Starting by decking the halls of the drafty home they are staying in with his own childlike impulses - like a lemonade tap in the kitchen and a wonderland of toys in the children’s bedroom - the Doctor is ready to indulge himself and enchant the Arwells. His actual gift for the children is, of course, cloaked in a giant, TARDIS-blue box under a buzzing and whirring Christmas tree in the sitting room. When curious Cyril opens the box on Christmas Eve, he reveals a rabbit hole into a Narnia-esque planet, Androzani, in the year 5345. Unbeknownst to him, it leads to a tree farm that is moments away from being melted down for battery fluid by acid rain. Cyril, followed by the Doctor and Lily, and eventually Madge, discovers that the life force of the trees is trying to escape the planet in a crude airship – but the trees need a strong “lifeboat” to help them, in the form of a person. While this adventure into another time and place feels ominous at times, it is full of witticisms from the Doctor, touching observations about the meaning of motherhood and family, and another rollicking journey that only Doctor Who could deliver on Christmas. The Doctor is full of great one-liners (“I love clever,” “There are sentences I should just keep away from,” “Hold tight and pretend it’s a plan”) and up to his usual antics, but there is a slightly melancholic mood that descends at times, and it isn’t just because of the absent Mr. Arwell. And when Madge delivers on the promise to her children – “Mummy always comes” – by piloting a giant walking platform to reach the Doctor, Lily and Cyril through the acid rain downpour, the episode’s emotional bottle rocket is just beginning to open up. It is also Madge who has to pilot the “mothership” away from the planet and into the time vortex so they can make it home for Christmas. The flight home is filled with visions of Madge’s husband, from the time she met him to his untimely death, which is also flashing before the eyes of her children. When they land at home, she tries to explain that their father died because there was no moon or stars to light his way home. But in a twist of fate, perfectly orchestrated by the Doctor in the first place, their bright trip through the time vortex provided a light for Reg Arwell to follow home. 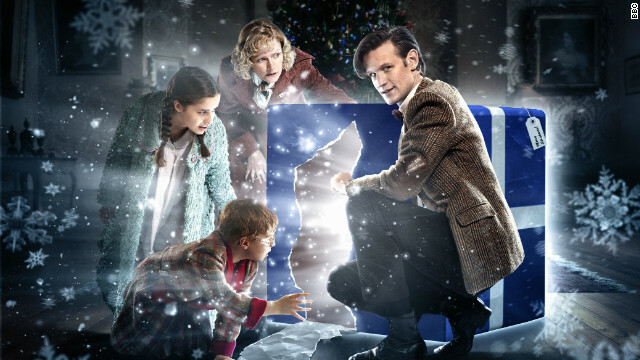 As the Arwell family reunites, the Doctor knows he has delivered his Christmas miracle and it’s time to leave. He readies the TARDIS, but Madge stops him, trying to invite him to stay. As she has reinforced throughout the entire episode, “No one should be alone on Christmas.” He tells her he has friends, people that love him, but they don’t know that he is still alive. Madge begs him to think not of himself, but of his friends, and to go to them right away. When we see the Doctor knock on a front door the color of TARDIS blue, is it too much to hope that he will have a Christmas reunion of his own? Sure enough, Amy Pond opens the door, pointing a water pistol that is meant for use on annoying carolers. Their awkward, stilted conversation reveals to the Doctor that River Song told Amy and Rory the Doctor never died. Even though each of them insists on not being the first to hug the other, Amy and the Doctor can’t help themselves. Amy and Rory invite him in for Christmas dinner, and it’s no trouble because they always set a place for him at the table. Are you crying into your Tom Baker scarf yet? If watching this stunning, intertwined storyline of heartwarming Christmas cheer and fairy-tale antics didn’t fill you with joy, I don’t know what will. As charming as when he popped out of the TARDIS and rifled through little Amy Pond’s kitchen looking for fish fingers and custard, Matt Smith’s Doctor enchants, supported by a lovingly chosen cast and Moffat’s engaging story. And we can now add "humany woomany" to our string of favorite Doctor Who phrases, like "wibbly wobbly timey wimey." Not only did we get to see our beloved Doctor together with Amy and Rory before they all disappear for a year, but we also glimpsed another side to the Doctor’s paradox that we will never fully comprehend, even after 11 incarnations. For that Christmas gift, it’s easy for this Whovian to be thankful. What did you think of the Doctor Who Christmas Special? Sit down, grab a Jammie Dodger or two and let us know in the comments below! Hello! bgfeeac interesting bgfeeac site! I'm really like it! Very, very bgfeeac good! Hello, Neat post. There is a problem along with your web site in internet explorer, would check this? IE still is the marketplace leader and a large part of folks will omit your magnificent writing because of this problem. Finally saw it and loved it! An excellent Christmas special. To all DT fanboys, David Tennant (as the Doctor) is dead and buried! Get over it already! We are happy that Asher is getting bgiger each week. Take it easy Krissy. Carrying all that extra weight is not easy. We had 2 days of Spring last week and now more snow and cold. We were in AZ in January and it was beautiful. Now we leave Friday for Laughlin just for 4 days. Retirement is wonderful! Love to all 3 of you! My daughter and I have bonded over Doctor Who. I've been a fan since the Pertwee days. We were both excited by the Christmas special. Some very classic lines. I wish the tennant fangirls and fanboys would just shut up already. He's the doctor. he regenerates. There were 9 doctors before him and hopefully will be 9 or more doctors after him. If you preferred RTD and Tennant's run, then good for you. But the show didn't rise and set on them and never will. Whining that it doesn't is going on 3 seasons of old now. Move on. The show has. This was a fun Christmas romp. They always are. And please don't act like RTD didn't write some less than stellar moments himself. Killer Christmas trees? Farting aliens? Please. I liked him but he wasn't some untouchable god of amazing writing. Just sit down, shut up, and enjoy the show. Charming special. I laughed a lot during it. Anything that makes me smile, and puts dust in my eyes, is "special." And I adore Matt Smith's Doctor. He's charming, delightfully delirious, and can be so darned sweet. I love all the Doctors because every Doctor IS all of them. Matt is just such a wonderful distillation. The Special was "special." I'm happy. 1) at the beginning falling into space the doctor would had froze in seconds. it absolute zero there. 2) Falling to earth would have burnt him up and htting the ground would have killed him. 3) The widow saving her husband should have brought out creature. Remember a few seasons back when Rose saved her father???? They were attacked by creatures in a church. 4) The doctor isn't human so why does he care about a recent holiday? Maybe next year the christmad special will be set at christ's birth. Think of all of the fun they could have with wise men and such. 5) Matt needs to get a some sun. He's sickly pale. I love the show but only David Tennant is The Doctor ..... I refuse to accept that Matt Smith guy as The Doctor; he's horrible. -– oh come on – Matt's not that bad. it took a while for him to grow on me and I've come to like him. He's a good quirky Doctor in his own right. Now the storylines this season, that's a different matter. They're written more like a crummy American science fiction show where all too often major plot points and major events aren't remembered from episode to episode. That used to nearly never happen in Dr. Who. I've been a Whovian since the first Tom Baker episodes aired on the west coast years and years ago. When my daughter was tiny, she'd hear the theme music and come running (even back when she was only two or three) to watch the opening credits and when she was older, sit with me to watch it... Great, great times. Then you obviously aren't a real Whovian...shoe now...Love Tennant, but there were good Doctors before him and there is a better one yet to come I am sure. No, Tom Baker is The Doctor. And Jon Pertwee. And Peter Davison. And..... Tennants increasingly over earnest and eternally apologizing ( "I'm really, really, sorry....") became grating. Matt Smith is doing an excellent job, and if you can only see or enjoy 1 Doctor, then it's your loss. The heart of Doctor Who is The Doctor himself, not the actor playing him. It was okay. Yes, RTD was often cheesy and over the top with his plots, but Moffat's work over the last year rarely gave me goosebumps. Which is too bad, because Matt Smith has really grown on me. I did love the "hold tight and pretend it's a plan" line, though–new classic! And I'll admit, there was a bit more heart in this one than most of Moffat's, or at least, the actress playing Madge brought more heart to it. I really thought after all the wait that this would be a really good Christmas special. I was wrong. It was ok. And I am really tired of River Song. Good grief how many times can you say "spoilers" and "sweety". Give it a rest! I agree with who ever said SM was better with Russell Davis, with RD being the best. I still cannot get attached to the new doctor. DT and CE are much better doctors. And Amy is getting really tiring. Though Cory is great! But after all the complaining – Doctor Who is the best SciFi on TV. I can' t stand the writers of the 11th Doctor. I watched the first new series with Matt Smith and while I enjoyed Matt's performance, the story lines were pretty much the same as the 10th and 9th Doctor. It gets old after a while. I want to say my favorite Doctor from the new series is 10. David Tennant had the ablilty to move me to tears, anger me and make me laugh. His story lines had some substance, while sadly, the 11th's does not. I hope they get some better writers and soon. I was totally not impressed with the special. I waited so long for that! I am trying to see past Matt Smith and enjoy the story line and even that leaves me with me needing a David Tennant or Chris Eggleston fix. Where are the nasty aliens? Where was the attacks?, where is saving the world? and to push my point we have to wait till next summer??? Time for the Doctor to regenerate. Every actor bring their own personalities into the mix. Some better than others. Is there any other series on t.v. that you would rather watch than doctor who? Not me. I love all the doctors. Not quite as good / as brilliant as the Christmas special last year, but defs hit the right emotional points. But man, is it ever going to be a long wait for next fall. Matt Smith... best dr yet. Loved David but something about Matt is so much fun and quirky. Plus River just rocks. These are my favorites since Matt came on board. Each season ender out did the last. The Christmas episode was fun and light hearted I really enjoyed it. Gotta agree. Totally enjoyable episode, with the human element needed in a Christmas show. Matt's the best, and yes, River ROCKS! Great writing. Can't believe anyone thought otherwise. It was ok. But It wasn't the best of Christmas espisodes. Matt and Karen have grown on me, but when I watch previous episodes with David Tennant I tend to feel the shows has more depth. Adorable. Love how gentle, slightly simple mum Madge becomes the heroine who saves everyone: the Spaceman-Angel, a world of tree souls, her children, and her dead husband, negotiating through the Time Vortex to do so. Brilliant. The WWII Narnian setting was the icing on the cake. Best Christmas Special ever! The new Dr. Who Christmas special was good & entertaining but IMO not as good as previous Christmas specials. Still it's worth seeing for any Dr. Who fan. So true Derek. I did cry at the end as I always do. I'm so very glad The Doctor spent Christmas with Amy and Rory I think the shot of water with the water pistil was perfect. I have been really disappointed with some of Steven Moffat's work..... He did really well when paired up with Russ Davies, but once the latter left, stories just seem to lack......something. Finese? Continuity? Nothing that craps on science so much? BUT!! I do well to remember that this is the Christmas Special, and every year's special is positively dredged with more sappy and heart-tugging emotion in favor of realistic value and Scientific continuity. The Christmas show is always a fan-service, and what have the fans wanted more than to just be delighted because Christmas is whimsical and hear Tennat/Smith pull out some off-the-wall Doctor one-liners? I honestly don't have a favorite among the new Doctors. Tennant was brilliant and a joy to watch in the role. Eccelston brought a real edge to the character. And Smith has this really alien, old-professor vibe to his performance that's a lot of fun. As far as I'm concerned, all three were worth watching. First of all thanks a lot for such a cstoent. I will use the prize money in three parts. 1st part will go for the food of chipmunks around me. Sounds funny I know, but these days those little cuties are giving me such great poses to click that I have got a big 300+ collection in just a month!Second part will go for Christmas and new year celebrations.Lastly third part I will keep it as it is in my paypal account for future urgency.I really faced hell lot of financial problems in last two years and know how this can hit you when you do not find money to survive. So keeping a share for urgency will be good for me. You will really be glad when you have that one done. The defnirefce in the two eyes just about drove me nuts until I got the second one done. I agree with Shirley. You won't be nearly as nervous since you know what to expect. Like all the Dr. Who, I liked the story. But .. he's getting a little two childlike and comical. Sure each incarnation has a different personality, and this one is definately more childlike than anything. But I expect some seriousness to the stories. For example in this one, he falls into space with no protection, and while there grabs the suit he has to put on. And that suit protected him from falling into the atmosphere with no burn-up? And allowed him to impact the ground at least at 200 mph (around terminal velocity for someone falling though air, not taking into account reentry effects). Oh sure the suit is carrying out repairs on him. How does it know to repair a Time Lord? And then a person in 1938 London camly helps a space man (where did she get that concept) taking him to a Police box (1960's design so it's wrong, wrong, wrong) and heads on home? I like a fun story, yes. But tossing in to mych campy, silly, nonsensical stuff really hurts the story! The Christmas Specials in particular tend to be much more lighthearted than the average series episode. In fact, I like the blending of quick-witted humor with a more serious underlying theme. The specials, and particular episodes where this technique is used, are among my favorites. If anything, the humor underscores the ensuing gravity, as when the Doctor – after his madcap tour of the house – learns of the death of Madge's husband. The contrast in mood made that seen much more poignant in my view. 6 mgs a day?? That is way much. I believe the reomcmended maximum dose is 2.5 to 4, and they come in 0.5 pills. She's popping a lot. As a comparison I have a prescription meant mainly for anxiety and sleep which allows for up to 1.5 mg a day, but in truth, I only use it for anxiety, and even then, it's rare to do 1.5 mg a WEEK, much less a day. Most weeks I don't go near it at all.Ativan (Lorazepam) is very addicting. She probably is doped up.Sorry to hear about your father, but even more sorry to hear about your mother. She needs some help, and being submerged in Ativan isn't going to do it for her. See if you can get her to switch to a different doctor, or see one for yourself that you can talk to about your options in this area. MistyXoXo Posted on Thanks for the post, Clarice. My doctor first scspeuted that I might have arthritis, but the hand x-rays came back normal and that's when he considered Lupus. I hope you get through the winter without too much pain! Really like this episode. It had humor, heart, and boy do I miss that goofiness. I didn't care for the last Doctor Who Christmas episode, but this one made up for that one. I remember that episode on the SyFy Channel (or whatever they call it now). There was definitely a kiss at th end. Maybe it's been editted since, but when it was first shown on SyFy, before it was on BBCA, the kiss was in it. The original doctor stares at his double as they kiss, realizing he'll never get that opportunity himself. I miss that episode! That was a great episode! I'm going with a 50/50 chance (your pic is the same as mine and the v gives me no hint at all lol) if you're flamee and have been on birth control for more than 3 years, ask the doctor to run a PT,PTT,INR. This a test to check for clotting factors in your blood. birth control pills causes blood clots. I takes 1 extra tube of blood and is a test that is covered by insurance if you have been, or are on birth control.best of luck. This was the perfect end to Christmas day! I’ve been watching The Doctor since Tom Baker. Some advice. If it says “spoiler alert” don’t continue and it’s Doctor Who, not Dr. Who. i have taken ativan beofre myself and had to take 1 mg at first then they moved me to 2 mg, but i only took them in the morning and the evening. i have children so i cant be zombied out. it didnt end up working for me, so they switched me to xanax which is better for me. it does sound like an awful lot, but if he prescribed it to her, he must think it is alright. maybe she needs a bit more time to adjust to the meds. if not, go back to her doc and influence her to try a different med. good luck. Just having the Doctor Who Christmas special on Christmas on BBC-America is a joy in itself!! Add that marathon of the Christmas specials, and of the current season, and I had perfect birthday viewing - my birthday is December 25th. But alas and alack, my heart belongs to the 10th Doctor, David Tennant. I just discovered Dr. Who this past year, and I love the series, the doctor(s) and especially the Christmas specials. For future reference, it's "Doctor Who". "Doctor" is never abbreviated in his case. Oh, shut it. You know what she meant. If you didn't see the Doctor Who Christmas special on BBCA last night, what kind of Whovian are you?!?! Because this jazz is totally bigger on the inside. Or, you know, people who were with family for Christmas. And by the way, thanks to whoever wrote this for giving away everything. No $#%*ing need to watch it now. This really ticks me off. You can do a very fine review without giving away every point, including the emotionally satisfying (or would have been if it had been a surprise) ending. Seriously, thanks. So what part of "Spoiler Alert" did you misunderstand and therefore read on anyway? HELLO!! Deej59 does well in class but his reading comprehension skills need much improvement. "SPOILER ALERT: If you didn't see the Doctor Who Christmas special on BBCA last night, what kind of Whovian are you?!?! Because this jazz is totally bigger on the inside." If you're too stupid to understand a spoiler warning I doubt you'd understand Dr. Who anyway. Nick Jr. called. Spoiler alert: Dora goes exploring in the next episode. One who has his DVR die while I was out Christmas-ing with the family :(. At least I got to read about it. Or those of us Who missed it because they foolishly aired it opposite a Green Bay Packers game. It was a good episode. Having been a kid that watched EVERYTHING on TV good and bad growing up, I remembered the Dr but was never really into the show as a kid. It was the 9th and definately, 10th DRs. that made me a whovian. In fact I have not only become one myself but I have converted others. I really enjoyed the redo of all of DR who from the Daleks to the cybermen. The aliens were cool, the situations were original enough to make me go wow and though I see how they could run out of ideas, I am hoping that we get a couple more seasons. I hear next season is going to be split and may be the last. Well if Dec 21, 2012 is the beginning of the end of the world I hope that I will get to see the next DR Who christmas special before the earth ends. I doubt it will be the last. They're splitting the season so it overlaps with the show's 50th anniversary. It may be Matt Smith's last season, but he was quite insistent that he wanted to be part of the anniversary. But the show is very popular, in Britain and elsewhere, and I don't believe it is threatened. Haven.t seen it because I don't get bbcamerica and Amazon is selling the short preview instead of the episode – for the same cost as a full episode. I love sci-fi, but I really cannot see the point of this show at all. Its boring. Maybe I should check out the original series. You'd have to go back a long way. The original Doctor arrived in 1963, & the series ran into the 90s before being cancelled. It was then revived in 2005, & is the same series. The Christopher Eccelston Doctor is the same character w/ the same history. If you find the current version boring, you will certainly not like the earlier series. Doctor Who is about story telling & characters, & having fun. It isn't meant to be "hard Sci-Fi"
The Fifth Doctor didn't make it to Androzani Major. He was poisoned on Androzani Minor, which was a much more harsh planet, and not one he'd take children to. It had a barren landscape and random killer mudbursts out of the ground, not trees.. He's mad, not psychopathic. Nicely done with the details, and all true. Thank you for the clarification. Thank you, Brian! I was at the point of screaming, "All you kids, GET OFF MY LAWN!!" since no one seemed to remember a Doctor before Eccleston. Seriously, people, there are decades off Doctor Who that you're missing - RTD will always be appreciated in this household for bringing the franchise back, but Moffat is making it good again. There's no indication that the Planet of the Christmas Trees is Androzani Major. The crew of the harvester announce to Madge that they're _from_ Androzani Major, which suggests that they're from somewhere besides the planet they're standing on. The Doctor identifies the harvester as an Androzani harvester, but again, no indication that it's on its home planet. Im irnetsted in a set of LG/long redington sonic pro waders if they are still available. What form of payments do you take and how can I acquire them. I love Dr. Who! 🙂 I'm a huge fan; however, I did not yet see this year's Christmas episode because I always watch it later on Netflix. Netflix is one of the greatest values for money in media entertainment. For a mere $7.99 per month I get access to all of my favorite shows; Burn Notice, Psych, Dr. Who, all of the Discovery Channel programs including Myth Busters and Dirty Jobs, Sherlock a modern day Holmes detective show from the BBC and many more! Way to go Netflix! What position do you hold a Netfix (and, yes, I'm spelling it that way deliberately)? Netflix uses the now-defunct proprietary Microsoft silverlight platform locking Linux users out(this was deliberately done by the anti-open source Microsoft monopoly). If you don't think this is a problem MOST embedded devices use Linux. It's not just a desktop OS. This is why there is no cheap set top box for netflix. I'm an EE and could build a cheap netflix box, but it would violate the DMCA due to microsoft not releasing the encryption stack for open source use. The idiotic choice of Silverlight is just another example of the Poor decision making at netflix that will continue to keep it sidelined and prevented it from making BILLIONS of $$$, Netflix fire your CEO and board of directors and put someone with at least some common sense in charge. Netflix doesn't have a good selection of movies or tv shows. I used to be a subscriber and the the Netflix library is very, very limited. It is pathetic actually. I have tried Amazon Prime and it is even worse selection. Very few movies are available on Amazon and all that are available are at least 15 years old (most movies are actually 20 -30 years old). In a way Amazon Prime / Netflix video streaming is a scam – they want you to subscribe under a false premise of free content when none is available. I found it easier just to rent movies at the local movie store or from the iTunes. I would have to disagree with you Alex. While I will say their movie selection isn't amazing, you can't beat the deal on shows. I would imagine since you are posting in a thread about Doctor Who thread you are a Sci-Fi fan. Netflix currently has every episode from all Star Trek series available as well as long having the new Doctor Who series. If you wanted to buy or rent those you would be shelling out hundreds. corect sorakaaya vaaankyaa evainaa elaa tinaalo alaane tinaali.anni padaardhaalu sareeraaniki kaavaali antay kaani pachhevi tinaali ,oil lekundaa tinaali ani chepatam puurtigaa avivekam.maa vullo okadu visham taaginaa batikaadu atlaa ani visham taagi andaruu batakaleru.kaavunaa pasuvulu anni pachhigaa tintunnai kaabatti manushulu alanay tinaali ani cheppay vaariki idi manchi vudaahaarana. Sure, it wasn't as good as say last year's special but it satisfied those wanting another episode. It was no "Lion, Witch, and Wardrobe" but it was the magic of Doctor Who that drew you in whether one liked it or not. Some Doctor is better than no Doctor. I think they did a fine job especially since the entire family, Whovians and non, sat down and watched it. That was the magic. The Doctor Who Christmas special..... I didn't get a better present! This episode reminded me what I don't like about Stephen Moffat's work. So predictable, so unoriginal. Once again, if you imagine something, it will happen. What an easy and uncreative way to write yourself out of any situation, which Moffat does for every episode now. The only way my husband and I can get through these episodes is to pretend it isn't about the Doctor's adventures, but rather just a failed spin-off of an incredible series. Completely agree. Moffat wrote a couple of good episodes back when RTD was doing the series and I wish it would have stayed that way. Wish it _had_ stayed that way, not _would have_. Seriously, this is one reason reviews slamming Moffat and praising the Rose-adoring RTD are considered light-weight. It was a great episode! Since the Doctor returned in 2005 the show has gotten better & better. It is one of the best-written, & produced shows on either side of the ocean. Bravo BBC!